MK Dov Lipman supports criminal sanctions for hareidi draft-dodgers, asks: why should they be different from anyone else? 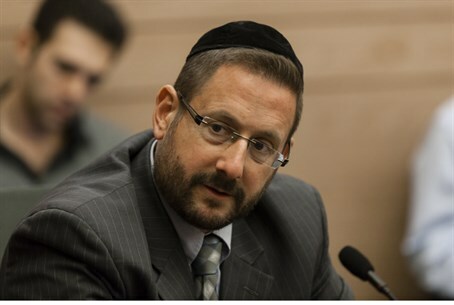 Arutz Sheva spoke to MK Dov Lipman (Yesh Atid) about the Equal Burden of Service Law Monday, as the Knesset Committee began to wrap up its discussion of what sanctions should be used against draft-dodgers. According to Lipman, the feeling in the Knesset is that history is being made. "We are returning the hareidi community to society, both on the front and in the workplace," Lipman explained. "This is very important - both for hareidi society and Israeli society." Lipman remained puzzled at opposition to the law, which he clarified has been made alongside constant dialogue with the hareidi public. The MK noted that he personally has met several from the hareidi community - both young adults and older men - who are eager to join the IDF and the workforce as part of wider society. Opposition actually comes from the hareidi politicians, according to Lipman, who noted that they "do not miss an opportunity to miss an opportunity. They want to keep them [hareidim] in a circle of poverty and separated from society, but it will only strengthen the Torah world and the hareidi world as they set out from poverty to join the workforce and return to being one people, with one destiny, working together." Lipman emphasized that the law introduces a gradual process and is designed to help IDF veterans from the hareidi community find work after completing service, with the understanding that not everyone can conceivably sit in a Torah study hall and learn Torah every day for a living. When asked regarding the criminal sanctions being proposed for the law for hareidi draft-dodgers, which Jewish Home chairman Naftali Bennett has counter-proposed with economic sanctions, Lipman noted that the edict is really no different than the laws for any draft-dodger in Israel. The Equal Burden of Service Law does not focus on the hareidi community per se, according to the MK, but rather promotes equality among the various sectors of Israel's population. Thus, economic sanctions would promote inequality, says Lipman; the wealthy would be able to pay the fines and keep dodging the draft, whereas the less wealthy will not. The new law was brought back into the public eye following a High Court ruling suspending funding to yeshivas whose students had their enlistment deferred. That postponement was ordered by Defense Minister Moshe Ya'alon to give the Shaked Committee time to finish its work. While the ruling was thought to be meaningless, given that February yeshiva funds had already been allocated, Finance Minister Yair Lapid took advantage of a loophole to retroactively cancel funding to all yeshivas last Wednesday, sparking massive hareidi protests.